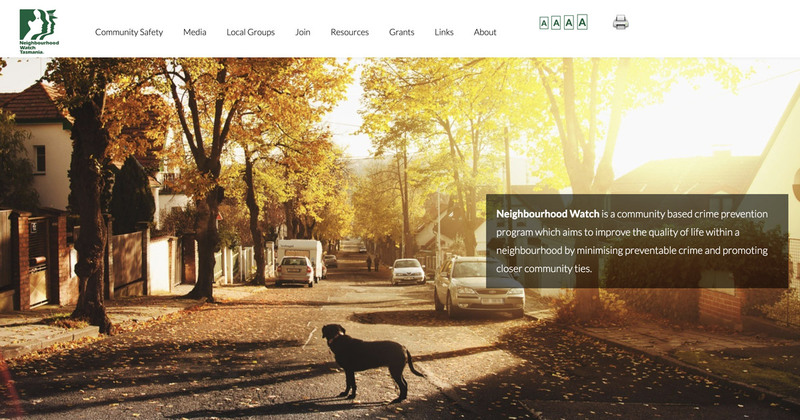 Neighbourhood Watch Tasmania website refresh. The board of the Neighbourhood Watch Tasmania organisation responded very positively to our approach in late 2018 when we suggested their existing online presence could use a renovation. The site hadn’t been updated for many years, and while there were lots of essential information available it wasn’t presented in a modern style, was not secure and was difficult for users to view on mobile devices. The Neighbourhood Watch program is governed by a national body but each State’s online presence is managed independently so the NHW Tasmania Inc. Board put a lot of thought into what they wanted to achieve and gave us the green-light to build their new website. Convey information about the state body, the NHW program including privacy information. Display contact information about current list of local groups. Display information about membership including an online form to receive applications. Display information about their Small Grants Program and enable online applications. Make available a range of downloadable content for community and membership use. Incorporate their social media activity to negate the need to blog on a second platform. Ensure site accessibility was factored into the design. Provide links to partner websites. The goal of the website was to provide trustworthy information about Neighbourhood Watch Tasmania and improve its usability on all devices. This was achieved by creating a new WordPress site with a pro theme and plugins to deliver each component. Page security was enhanced by the installation of an SSL (Secure Socket Layer) certificate (https). The overall style was kept deliberately clean and uncluttered. Each page was created to make it easy for a site visitor to find exactly what they want from the main navigation section. Two online forms were created to handle new membership applications and Small Grant submissions. Site visitors can change the font size by making a relative sizing selection from the main navigation bar. To avoid duplication across multiple sites we built in links to document libraries on the national Neighbourhood Watch site to establish a single source of the truth for documents and brochures as the catalogue changes from time to time. The Tasmanian Neighbourhood Watch community now have a responsive and interactive online presence that conveys their brand, mission and the important part they play in the safety and security of the people of the state. Visit the Neighbourhood Watch Tasmania website. If you have a business website that hasn’t been updated for a while and you are looking for a cost-effective solution please feel free to get in contact.